Tuva Archives | Untamed Borders - Adventure travel.. This eight-day trip will take you into the remote and rural western region of the Republic of Tuva. 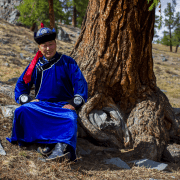 Being the epicentre of traditional Tuvan culture you’ll have a chance to meet with nomadic pastoralists, master craftsmen, throat singers and musicians. The area is also replete with archaeological remains which you can explore, ranging from Scythian era burial mounds to standing stones and petroglyphs. The second half of the trip will see us venture into the backcountry on horseback for three days near to the border of the Altai Republic. During this time you’ll also have the chance to trek in the rugged range and sub-alpine lakes which feed into Western Tuva’s most fabled river, the Alash. Trek and horseback ride in the mountains of Western Tuva on the border of the Altai Republic. Visit nationally renowned local artisans specialising in ancient soapstone carving, blacksmithing and leatherworking in the impressive Bai-Taiga region, as well as master throat-singers and byzaanchy musicians. Visit the Ustuu-Khuree Temple – Russia’s earliest piece of Tibetan architecture. Seeking out the Scythian-era Genghis Khan stone idol, ancient Turkic burial sites and the standing stones and petroglyphs near Bizhiktig Khaya village. Experience the nomadic culture of Tuva. We’ll begin the day visiting the Geographical Centre of Asia Monument in the morning, the Tsechenlig Buddhist temple and a tour around the comprehensive National Museum, which has well-preserved artefacts from Scythian-era burial sites. Afterwards, we’ll visit the Tuvan Cultural Centre for demonstrations in local music and khoomei – the throat singing art form which the republic is most internationally famous for. The Cultural Centre is also home to countless other artisans and masters of music and creativity which you may be able to meet. Depending on availability there may also be a chance for you to partake in a music workshop and purchase handmade local instruments. In the afternoon we’ll head out to explore Kyzyl, the capital of Tuva, visiting the downtown black market and even the centre for the Republic’s shamans. Time permitting we can then head on foot or by vehicle to the north side of Kyzyl and watch the sun setting over the steppe from the summit of Doo-Ghey or another nearby peak where you’ll have miles long views of the Yenisei out to the west. The following morning we’ll drive out west to Ustuu Khuree Temple outside of Chadan – which is Russia’s earliest piece of Tibetan architecture and one of the most sacred places for Tuva’s Buddhists. Afterward, we’ll stop for lunch in Kyzyl-Mazhalyk and drive toward Bizhiktig Khaya Mountain which is home to more than three hundred Bronze Age petroglyphs which depict ancient scenes of local life and even an image of Buddha which is estimated to date back to the 14th Century. In the early evening, we’ll arrive into Sai-Khonash which is home to a number of nomad’s camps. We can spend the evening with a Russian banya, drinking tea, sampling Tuvan milk vodka [araga] and hang out with the numerous sheep, cows, horses, goats and yaks tended to by the nomads. This day will be a chance to relax and learn more about rural life in Tuva. We’ll have the chance to make traditional fresh cheese known as byshtak, learn the art of Tuvan throat singing [khoomei] from locally renowned masters, as well as general demonstrations of local instruments such as the byzaanchy – a local variation of a four-stringed fiddle commonly found throughout numerous steppe cultures. In the afternoon we’ll go on a short excursion on horseback down the Bayan-Khol River in preparation for our larger journey beginning the following morning. In the evening we’ll have a freshly slaughtered sheep and if you have a strong stomach you can learn how to skin, gut and prepare the meat ready for the pot. Day 4 will see us ride for 6-7 hours on horseback into the mountains to a yak summer camp. We’ll camp for nights 4 and 5 beside the Khoolaash waterfall area from where you can freely hike, swim, horseback ride and fish. On Day 5 we can embark on a hike through the forests and into the higher mountains near the Altai Republic. After an early breakfast, we’ll depart on horseback again downwards through the mountains and back toward Sai-Khonash camp. After breakfast in our ger, we will drive towards Bai-Taiga, a region renowned by Tuvans for its natural beauty. Along the way we’ll stop at Shivilig, a natural spring considered to have healing properties. In Tuvan language, these are known as an arzhaan and for centuries they have been central to their culture. Afterwards, we’ll drive 30km towards Kyzyl-Dag, a small village which is famous for the best craft makers in the whole of Tuva, many of whom are internationally recognised for their skills in crafts such as leather making, blacksmithing and soapstone carving. This is also a great chance to buy some of their one-of-a-kind work. Breakfast in Kyzyl-Dag and then departure back to Abakan. We do not directly arrange international flights or train travel in Russia. We can, however, suggest routes and operators. You will require a Russian visa for this trip. We will provide visa support and advice on how best to obtain this visa. If you are based in the UK or Australia then we can recommend using The Visa Machine as a visa agent. Visit the Untamed Borders page at their website – untamedborders.thevisamachine.com. We include all meals during the trip. The accommodation will be based on 2 people sharing a room or a tent. When we choose our vehicles and drivers we take into consideration the road conditions, the length of journey and the competence of the man behind the wheel. Whilst this journey is mostly by river and off-road vehicle where necessary, we can assure you that your comfort and enjoyment of the journey is our first priority. On this trip, you will be accompanied by a local guide assigned by Untamed Borders. Russia is a very safe country on the whole. Nevertheless, our client’s safety is our primary concern. We must state that the tour leader has the final word with regards to changes in the itinerary for safety reasons. Please note that at times when you are in Russia – and especially in Siberia – you will sometimes be given warning by the people you meet to be wary of drinking socially and sometimes even told that people can be threatening when drunk or generally a risk. Please don’t be too alarmed if you hear this. As long as you avoid getting heavily intoxicated with strangers you’re not comfortable with, don’t walk through Kyzyl’s streets at night and keep your eye out to avoid anyone drunk, you’ll have no problems.